Hey All! It's been windy and chilly here in New York for the past week. I had a few summer outfit ideas, but the dreary weather made those unappealing. It also happens to be final exam season... (＞人＜;) Jeans were the most practical option! 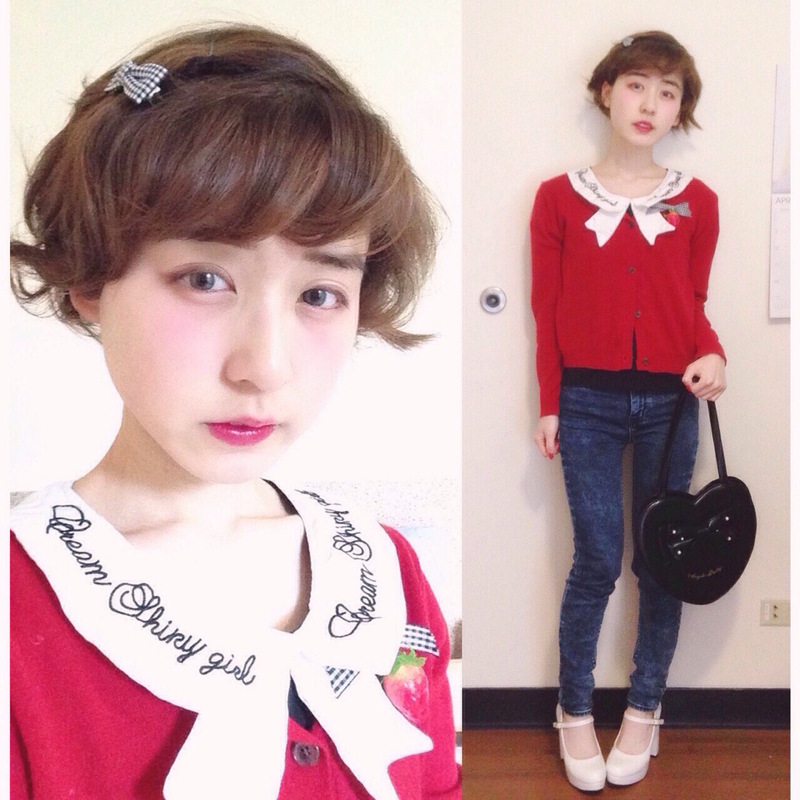 I was inspired Maria Kurotaki's pin-up dolly/retro girly coordinates in Larme 20 and 21. I loved the idea of wearing red sweaters, blue skinny jeans, and sockless pumps in the retro Larme style. I was also inspired by Ank Rouge's summer item lines with Risa Nakamura and Sayaka Kanda. Gingham, red, and strawberries abound! I feel uncertain about parts of this outfit. 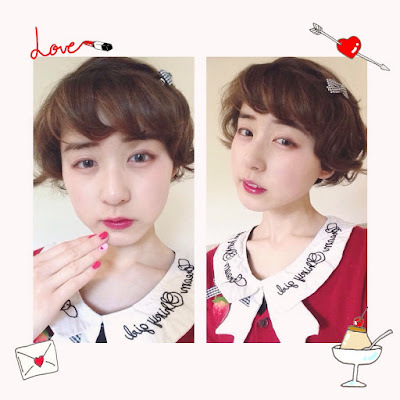 The overall balance of the outfit was aimed at the Pin-up Dolly Larme style, but some of the items are more suitable for the Romantic Girly Larme style. Although most of the items in this coord fit the Larme aesthetic individually, the outfit itself could have been more cohesive. For instance, I would ideally be wearing a red cardigan with a fur collar. 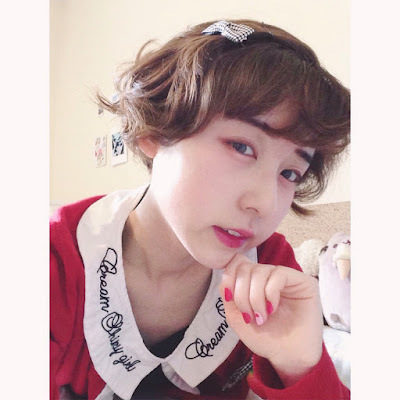 The dolly-style sailor collar of my top might be too sweet. I would also ideally be wearing retro blue jeans in a pure wash (rather than a distressed wash) and point-toed, strapless pumps. My bag could have been louder and more whimsical as well. I will be on the lookout for these items and will likely re-do this coordinate in the future. Another part of my inspiration for this outfit was my nails! 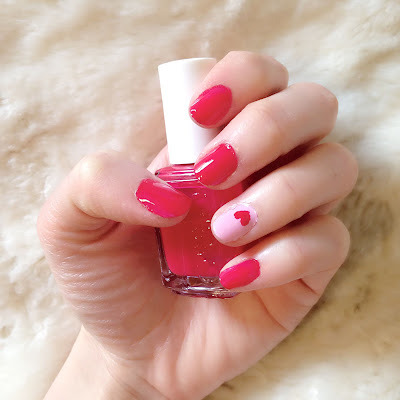 I've been seeing a lot of red and pink from Japanese nail salons on Instagram lately, so I decided to try them out for myself. I got Rose Bowl a few months ago, but I never wore it. I was afraid of the red being too overwhelming. I chose to wear Muchi Muchi as well to tone down the redness. But since Rose Bowl is blue/cool-toned, the color actually turned out to be classy and somewhat understated. (Well, as understated as red can get.) I'll try wearing Rose Bowl on its own next time. I've been practicing eyeshadow this week! I'm getting better at it. I think I'll practice eyeliner next week. Hopefully I can become a make-up master like Eri several years down the road, haha. Here are some fashion/beauty discussion questions that I'm curious about. I would love to hear your responses! What are your favorite colors to coordinate with? Do you match your nails with your outfits? If so, which comes first: the nails or the outfit? Do you have nail salons/nail artists? If so, which are they? I would also appreciate any other comments/feedback. First of all, your outfit is super cute!!!!!!! You might be right that it could be more larme-ish, but it's still really really neat! As for me, i like coordinating monochrome outfits the most (probably because all my favourite clothes are black or white lol) and red is my favourite accent colour too! I bought a really cute red heart cardigan from king louie recently and i've been kinda obssessed with it, so i'm wearing a lot of red lately. I don't really match my nails to my outfits, since i only do them once a week, but i think about my outfit mood?? like if i'm feeling more romantic i usually so white nails with pastel accents, and if i'm feeling more pheromone, dark red nails, pin-up and french regular red nails. I actually do my nails myself, because i really enjoy it, it's somehow super relaxing.